As Fishing Tackle Boxes Go, Well, Mine Weighs Twenty-Five Pounds Loaded. How About Yours? After loading numerous tackle boxes over the years I've finally come to grip with an irrefutable fact of bass fishing. No matter how big it is. No matter how many pockets, side compartments or drawers a fishing tackle box has, you won't be able to carry an entire tackle shop with you. I know this because I continue to try and continue to fail. I suffer badly from the fear of not having what I may need so I embrace with wild abandon the concept of, "I'd rather have it and not need it than need it and not have it". My fishing buddies think I'm nutty as fruitcake but when on the water to whom do you think they turn when they don't have what they need? I should start charging! I'm a firm believer that it's all about the tools, no matter what you're doing, and it's no different with tools for fishing. Have the right tools and your job is easier and more likely to be done effectively and with more enjoyment. That's where fishing tackle boxes come in. On the water they can offer up your bass fishing accessories in an organized, quickly accessible manner that translates into more time fishing than time "fixen to fish". Today, when off the water, they also serve as tackle storage systems. 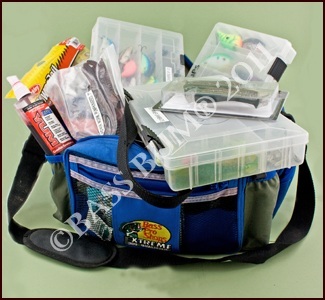 Fishing tackle boxes come in metal, plastic and heavy duty polyester, They're small, medium large and humongous in size. Many have mesh pockets and pockets within pockets both shallow and deep. 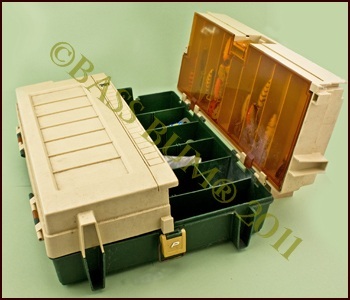 Let's take a look at some of the features of today's fishing tackle storage boxes. In the past tackle boxes were predominantly hard, either a metal tackle box or a hard plastic tackle box. They were designed with flat, trunk or hip roofs and when opened presented two, three or four levels of trays for lures and a center area for holding everything else like the "satchel" style example shown at left. While these styles do indeed facilitate easy access they're limited in their flexibility, versatility and capacity. This can cause the angler to have several for species specific fishing, i.e. panfish, bass, walleye, muskie etc. Additionally, the center bulk storage area can quickly turn into a impenetrable mess of fishing accessories waiting to maul any hand that should brave reaching into it. However, a recent addition to hard plastic tackle box designs is the addition of space that that accommodates plastic utility boxes and in so doing adds a degree of flexibility not previously a feature. These are a cross between soft and hard. I've not tried them but intend to. Plano® is the apparent leader in the design and manufacture of hard tackle boxes but I'm sure there are others. Today a soft tackle box is the choice of many bass anglers, including me. Soft tackle boxes offer the angler much more flexibility to change and organize it's content quickly for the needs of any upcoming trip. They're durable and easy on the body as well as forgiving if dropped. Following are some soft tackle boxes that, though essentially the same in function, do have a variety of little features that set them apart from one another. They're all good. Fishing tackle box flexibility is accomplished by using numerous smaller plastic tackle boxes, or what some might call a fishing lure box or plastic utility box, with it. These handy little things come in all shapes and sizes and some are even lure specific. The stack shown in the photo left is what I'm talking about. Start with a large, but not humongous, fishing tackle box. You'll need it as time goes by. While I find the soft tackle box most preferable you may find a metal tackle box or a hard plastic tackle box more to your liking. As with most things in bass fishing there are few hard and fast rules. However,if you get one too large I assure you it will get in the way if your in a boat and will throw your back out lugging it along shore. Hard plastic tackle box, metal tackle box or soft tackle box, these are your choices. Each material is durable. Metal dents, plastic cracks and soft side material can tear, though I've never had it happen. That denier polyester is tough stuff and the cloth models are lighter so can carry more stuff. 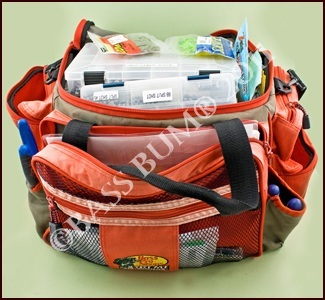 An important consideration with other than soft tackle boxes is the closing mechanism. Some can be quite flimsy and once broken a royal pain to replace or repair. Check them before buying any fishing tackle storage box. With soft versions zippers are utilized and, knock on wood, I've never had a problem with any. A wet or damp tackle box is trouble. Rust loves hooks and other metal parts. Check for watertight gaskets, drains and ventilation features. Some have them, some don't. What Goes In A Fishing Tackle Box? Whatever you like, and then some. No rules here. I cram everything I can in mine as evidenced by the 25 lbs it weighs. As for your primary tackle box, there is no right or wrong. Set it up the way it fits your fishing style and techniques. 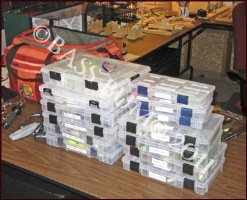 However, I suggest it should have plastic tackle boxes organized by lure type. Also segregate terminal tackle, hooks, sinkers and swivels for example. I usually have no less than five or six size 370 utility boxes and as many as six smaller size like 350's. Pliers, scents, maps, bobbers, extra line, digital scales, a small flashlight, hook disgorger, tape measure, wire cutters, BogaGrip®, Canon Power Shot A1000IS camera (gotta keep a record), Gorilla tripod camera stand (for taking photos when I'm alone),line stripper, plastic lure glue, a lighter, reel oil, a can of Reel Magic®, headlamp, hand-warmers (winter), knitting needle (for backlashes) and hand held radios are some of what you'll find in my fishing tackle box.